Every fall I seem to latch onto a different seasonal ingredient to obsess over. Two years ago, it was sweet potatoes. Last year, it was winter squash. I think this fall, it’s going to be Brussels sprouts. I have so many ideas for them and I want to post them all. Brussels sprouts! Everyday! Every hour! Every minute! While everyone else is enjoying pumpkin and apples, I’ll be over in my corner with a bowl of delicious Brussels sprouts. And I won’t share them either! I wanted to do some kind of Brussels sprout stir fry and I remembered a recipe I pinned a while back from In Pursuit of More–a 15 Minute Brussels Sprout & Tempeh Stir Fry. I built upon that combination, adapting the stir fry sauce (which doubles as a marinade for the tempeh) and adding soba noodles at the end. It’s a one-bowl meal, which is always my favorite kinds of meal because who really wants to cook 2-3 things for dinner?! Roasting will always be my favorite way of cooking Brussels sprouts, but making them in a skillet is a close second. They’ll still get a little bit caramelized and the bitterness that so many people object to mellows out. 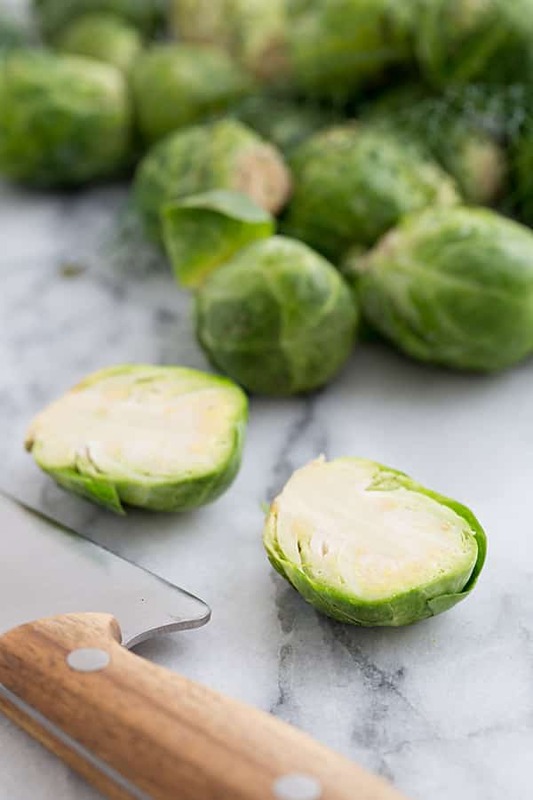 And making sprouts in a skillet takes a lot less time than roasting them–no more than 10 minutes if they’re thinly sliced, compared to about 40 minutes in the oven. The year of Brussels sprouts has begun! 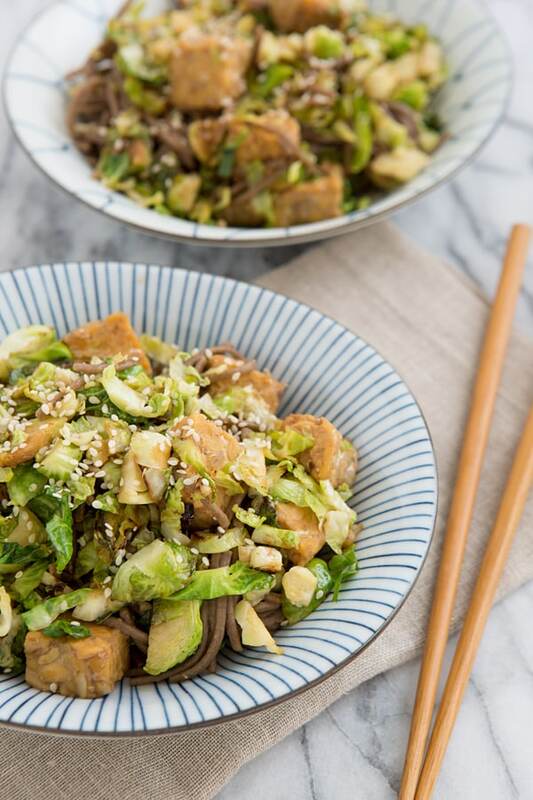 A stir fry made with thinly Brussels sprouts, marinated tempeh, and soba noodles. Adapted from In Pursuit of More’s 15 Minute Brussels Sprout & Tempeh Stir Fry. Whisk together the garlic, tamari, rice vinegar, maple syrup, and sriracha in a small baking dish. Add the tempeh and toss to coat. Marinate for 30 minutes (no more than that, because you don’t want the tempeh to soak up all of the marinade). While the tempeh is marinating, you can slice the Brussels sprouts. Heat the oil in a large skillet over medium-high heat. Add the sprouts and cook for about 5 minutes, or until they’re just beginning to brown. Stir in the tempeh and cook about 3 minutes more, or until it’s heated through. Remove from heat and pour in the remaining marinade and toss the sprouts and tempeh with the soba noodles. Divide into bowls and sprinkle sesame seeds over the top. If you don’t have sesame oil, any oil with a high smoke point will work. Not sure why brussel sprouts doesn’t get the attention it deserves. Look at that great looking dish, oh, yes all the spices, great. People seem to either love them or hate them! Nice! I’ve been wanting to get back into brussels (haven’t had them for years) and this looks like the perfect way to do it. I swapped out molasses for the syrup and a little chicken for the protein. We had rice noodles instead as that is what was on hand. Turned out great! I’m looking forward to exploring new ideas when it comes to sprouts. Thank you for this recipe! Who knew that feeling crappy from a juice cleanse would lead me to your blog. It was totally worth it. I made this recipe last night…so yummy and I have spiced apple slices in the oven now. Thank you, thank you for a great blog. I am in veggie heaven! Well I’m sorry it took a bad experience with a juice cleanse to do it, but I’m still glad you found my blog! 🙂 And I’m glad you enjoyed the recipe too! i have toasted sesame oil on hand…can i use it? It depends on the smoke point of the brand you’re using. If the smoke point is suitable for high heat cooking, it should be fine. Just tried this but found there wasn’t enough sauce, needed to double it. I’ve enjoyed tempeh in restaurants and then struggled to choke it down at home. What kind do you buy? Is there anything special I should be doing with it? This looks delicious and I want to try it! Looks delicious! I think I might try to combine elements of this recipe with the one that inspired it. I needed something to do with the Brussels sprouts I got at the farmers market this week. Hi, I’m a writer with Care2.com and I’d love to include a link to this recipe in one of my articles. Would it be alright if I also used one of your photos? Thanks!